These pictures show Hanwell station. Hanwell station will be unlike any other station on Crossrail. It doesn’t have a high passenger usage. Platforms will be too short for the Class 345 trains and selected door opening will be used. The stairs up to the platforms must be some of the most Victorian in any station. To complete the station, two lifts are to be installed on the Crossrail platforms. I do wonder if it could become a tourist attraction for those interests in modern metros and Victorian architecture. As current rumours are that Crossrail will open in December to Reading, it looks like the station will be ready in all its Victorian splendour.. It is planned that Hanwell station will have a train every ten minutes. I took these pictures as I walked up Charterhouse Street beside the new site of the Museum of London. The buildings to be used for the museum need a lot of work. The two buildings which could both be cold stores on the railway side of Charterhouse Street wouldn’t appear to have much architectural merit. Once Crossrail works are finished, there will be two big gaps leading to the railway lines and Farringdon station. 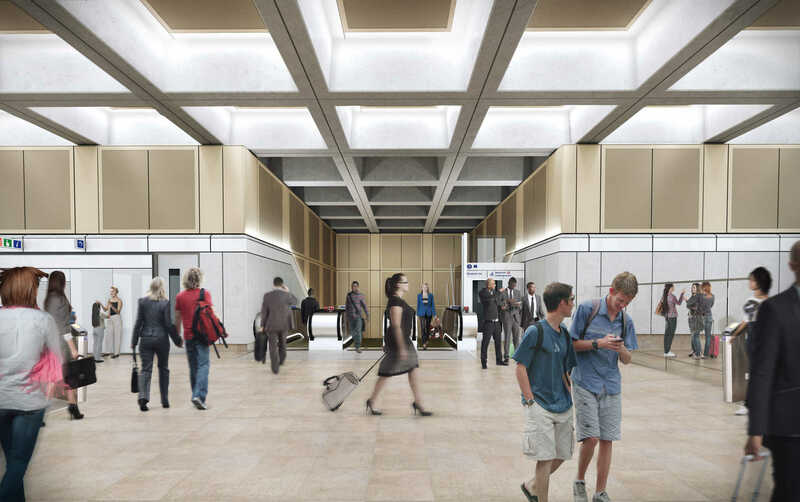 This picture from Crossrail says it is the Chaterhouse Street ticket hall. So it looks like that box in the third picture is an entrance to the station and it’s bang opposite the museum. This Google Map shows the space on the railway side of Charterhouse Street. Farringdon station at the top of the map towards the left. 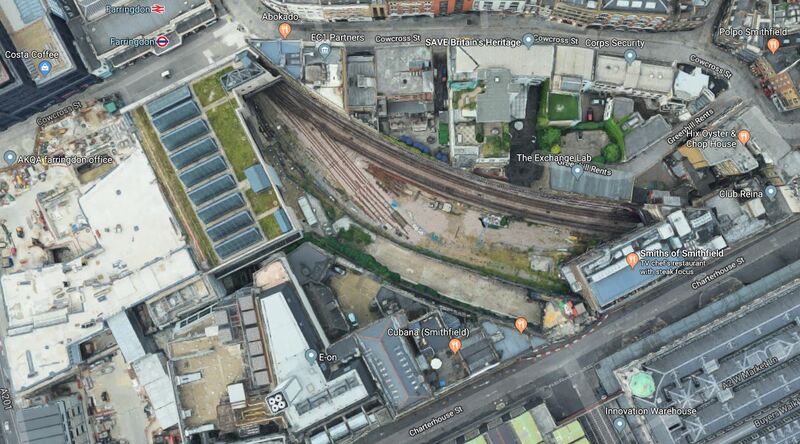 To the left of the station is the site I talked about in TfL Gives Go Ahead To Build Above Farringdon Station. Below that site, is another site on the corner of Charterhouse Street and Farringdon Road, that could either be developed in conjunction with the site above it or on its own. The Circle, Hammersmith & City and Metropolitan Lines curving between Farringdon and Barbican stations. What appear to be a couple of sidings are the remains of the Widened Lines, which used to lead to Moorgate. There is also a large curved space, which used to be which was used by services between Bedford and Moorgate, before Thameslink was created. There’s a lot of space in the area to create a building or series of buildings that provide. A worthwhile amount of office space. A landmark hotel on one of the best-connected sites in London. The right amount of retail space, bars, cafes and restaurants. But above all a short and pleasant walking route between Farringdon station and the new Museum of London could be designed. The title of this post is the same as that of this article in the Westmoreland Gazette. Plans for an Eden Project in Morecambe have received official backing from the Chancellor today as he pledged £100,000 in today’s budget to support the development of the proposals being led by Eden Project International. This is surely good news for the project. Class 153 trains are the unloved members of British Rail’s Sprinter family. I occasionally use one on excursions to Felixstowe, but they are cramped, noisy and slow. As the pictures show, some are not in bad condition and to be fair, some train operators have tried hard to provide a better level of service. Greater Anglia still has five Class 153 trains in service and the fact that they will be replaced by three-car Class 755 trains by the end of 2020. You don’t increase capacity by that amount, unless the current one-car trains are overcrowded or you know that there is a lot of untapped demand on the route. If on the Felixstowe Branch, a doubling of capacity would have been sufficient, then surely a refurbished two-car Class 150, 156 or 170 train, would have been a more than adequate replacement. Currently, there are seventy of these trains in service and many of them, like those in East Anglia are being replaced with new or refurbished trains. Greater Anglia’s five units are going to Wales, where they will join another eight on rural lines in West Wales. Nothing has ben said about how they will be used, but they could be used singly, in pairs or in multiple with Class 15x or Class 17x trains. So they could be useful to the Welsh in providing extra capacity. In the November 2018 Edition of Modern Railways, Alex Hynes of ScotRail talks about how a number of Class 153 trains will be used to add bicycle space to trains on some of Scotland’s scenic routes. Alex Hynes is quoted as saying. The interior format is yet to be fixed, but is likely to include a large amount of space given over to bicycles. Bike tourism is a growing area and the aim would be to allay fears about whether or not you’d get your bike on a train by providing plenty of space. Part of the vehicle might be given over to a lounge car layout to make the most of the magnificent views on these routes. Transport Scotland sees the scenic routes as a key part of the rural economy for the part they play in stimulating tourism. Our inspiration is to get “158s” on the West Highland route. So it looks like ScotRail could be running Class 158/Class 153 pairs to provide increased capacity on the West Highland Line. Wikipedia says this about the use of the Class 153 trains on the West Highland Line. These single car units are to be completely adapted to accommodate bikes, skis and other outdoor equipment. They will be attached to the Class 156s either as centre cars, or as extra coaches at either end. If ScotRail’s scheme is a success, I suspect more of the Class 153 trains could end up doing the same task, in Wales, the South West and North of England. It should also be noted, with respect to bicycle tourism, that ScotRail’s shortened HSTs will hopefully retain their bicycle swallowing abilities in the back ends of the power cars, thus enabling bicycle tourists to do the longer Scottish journeys with ease. My one worry about bicycle tourism in Scotland and Wales is not concerned with trains internally, but with getting there from other parts of the UK with a heavily-loaded bicycle. With the replacement of the HSTs and InterCity 225 from the London to Edinburgh and London to Wales and the West routes, will the new Class 800 trains have enough bicycle capacity? The bicycle storage on these trains look to be a good design for a racing bicycle, but some of the heavily-loaded bicycle tourists I’ve seen in Suffolk, would find them inadequate. This article in The Guardian is entitled New High-Speed Trains Go Slow On Provision For Cyclists. I wonder what provision has been made for bicycles on the new rolling stock for the Caledonian Sleeper? As I understand it, the new Orsall Chord in Manchester has been designed to open up a public space by the River Irwell. The headline says it all and there appears to be no-one who knows when it will open. For one time too, it doesn’t seem that Network Rail is the villain of the piece. I suppose the trouble is that this development has nothing to do with football! Come on Manchester, get your act together! The Zwntralbahn is the scenic railway, that connects Lucerne and Interlaken Ost stations along the Brünig Line. Wikipedia says this about the ownership of the railway. The Zentralbahn is a Swiss railway company that owns and operates two connecting railway lines in Central Switzerland and the Bernese Oberland. It was created on January 1, 2005, with the acquisition of the independently owned Luzern–Stans–Engelberg line, and the Brünig line of the Swiss Federal Railways. I don’t know, but as the railway is metre rather than standard gauge, I do wonder, if it was to Swiss Federal Railways, a bit like the Settle-Carlisle Line was to British Rail; Expensive to run, loved by locals and tourists and in need of new investment. These pictures show the railway. As some of the pictures show, the line was busy in places. and judging by the number of Asian groups on the train, a lot were tourists. The trains are modern Stadler SPATZ trains. They are able to use sections of the line which have a rack to assist climbing. Large panoramic windows for good views. It appears that the three-car train has been designed with all the electrical gubbings in the middle car, with the end sections similar to the Stadler GTW. Stadler seem to be able to shuffle their ideas and especially, the central power-pack to produce trains for all purposes. Greater Anglia’s Class 755 trains, and the tri-mode Flirts of the South Wales Metro, will be just more variations on the same theme. Brünig Line. The route is not simple and there is a reverse about half-way at Meiringen station. Searching the web, it appears that there is reasonably-priced accommodation in and around Meiringen. With a Swiss Pass, which gives a worthwhile discount on the expensive mountain trains, I shall be staying around there on my next trip to Switzerland. You could fly in to Zurich Airport and buy your Swiss Pass there. Lucerne and Interlaken are about an hour away on the scenic Brünig Line. Bern and Zurich are close enough for a day trip. I didn’t explore Meiringen, so check the guides first. But it looked OK from the train. From September 23rd, passengers will be able to take 300 kph trains between Hong Kong and Guangzhou. The Guangzhou-Shenzhen-Hong Kong Express Rail Link will give access to the Chinese High Speed Rail network for onward travel to places like Beijing and Shanghai. I can see a whole new tourism market opening up. High Speed Rail to Beijing via Guangzhou and other places. Only two long distance flights and a wide-ranging itinerary, without the hassle of airports. When the BBC reported this on Friday, they got a generally good reaction from the local residents they interviewed. Articles in the Guardian and The Times have been positive, with support from local and national politicians and other worthies. The Times too, has extensive positive comments from readers. For a project like this to be built, let alone be successful, it needs to have this sort of response on the first day. It is a project that obviously touches a happy nerve, sirs memories or just ticks all the right boxes with lots of people. So where will the Eden Project be built? 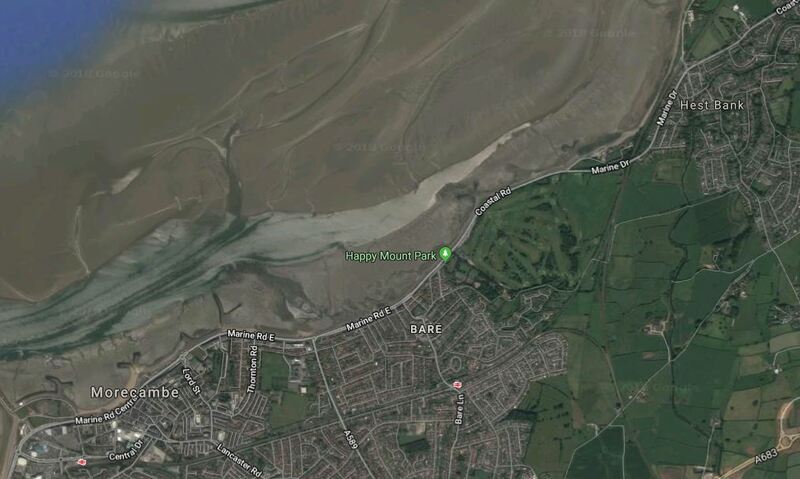 This Google Map shows the town of Morecambe and psart of the coast and bay to the North of the town. Nothing has been said about the location, but there would appear to be plenty of space. I’ve only ever been to Morecambe once, when I visited the town on my trek to visit all 92 English football clubs to raise money for pancreatic cancer research at Liverpool University. My brief visit to Morecambe is described in 92 Clubs – Day 21 – Milton Keynes, Morecambe, Newcastle. This was my initial comment on the town. The town was a bit of a surprise, as I thought it would be like Blackpool only smaller. It is smaller, but it is in much better state than its larger resort down the coast. You wouldn’t see anything as tasteful as this on a roundabout in Blackpool. My previous visit was very much a quickie, as I had to continue to Newcastle. On their web site, the Eden Project, says this about getting to their Cornish attraction by train. We are just a few miles from St Austell railway station, which is on the main line from London Paddington and is well served by buses to Eden. You could also take the train to Luxulyan, Bugle or Par, for a more scenic journey or to continue your trip on foot or bike. They also give a discount for visitors that arrive by public transport. As they should! If I was going, I’d take the Night Riviera to St. Austell and then use a bus to the Eden Project from the bus station at St. Austell station to complete the journey. So how would getting to the proposed Eden Project at Morecambe compare? Morecambe is served by the Morecambe Branch Line, This diagram from Wikipedia, shows how Morecambe is well-connected to Lancaster and the West Coast Main Line. The line has two stations in the town at Bare Lane and Morecambe and another at the nearby Heysham Port. Service between Morecambe and Lancaster seems to have a frequency of two trains per hour (tph) and a journey time of around ten minutes. There are also upwards of three services a day to and from Skipton and Leeds, which reverse at Lancaster. 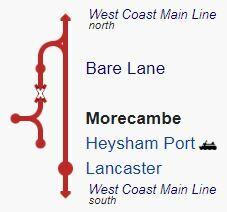 As both Bare Lane and Morecambe stations have two platforms and there used to be extra tracks along the route, I think it would be possible to create a railway system to Morecambe that could include. Two tph to and from Lancaster. Trains to and from Windermere via Lancaster, Carnforth and Oxenholme Lake District. Trains to and from Carlisle via Lancaster, Carnforth, Barrow and the Cumbrian Coast Line. There is tremendous scope to expand rail services in an area of scenic beauty, that includes the Lake District and the Pennines. Creating an iconic attraction at Morecambe could be a catalyst to develop the rail services in the wider area. A decent rail service with good provision for bicycles and wheelchairs, might also encourage more tourism without the need for cars. In my view, the short Morecambe and Windermere Branch Lines are ideal for services that use battery trains, which would charge the batteries on the electrified West Coast Main Line. All trains between Lancaster and Morecambe could use battery power and others to Leeds and Barrow might use hydrogen power after they left the electrified West Coast Main Line. Morecambe to Windermere could even be a 125 mph electric train on the West Coast Main Line, that used batteries on the short ranch lines at either end. Bombardier are talking about a 125 mph bi-mode Aventra with batteries. Diesel power would not be needed, so add more batteries. Battery trains are talking about ranges of thirty miles, in a few years. Batteries would be charged on the West Coast Main Line. The trains would not be slow enough to interfere with the expresses on the West Coast Main Line. The battery-powered trains would surely fit in well with the message of the Eden Project. I thought that I was passing the city, I should take a pit-stop in Bruges, with perhaps a gluten-free breakfast. If you go to most cities in Germany, there is always a handy tourist office at the station. As I didn’t know the city, I needed information on how to get from the station to the centre, which was a twenty minute walk. If it hadn’t been for a helpful local man, who spoke impeccable English, I wouldn’t have found out that the buses were convenient, but you had to buy the tickets from the paper shop inside the station. In addition, there wasn’t any visible staff at the station. How tourist-friendly is that for a welcome to one of the most important sites in Belgium? My gluten-free breakfast wasn’t very good either! It came with ordinary bread and only the tea was good. My argument is that if you advertise gluten-free, then make sure you can do it properly. Finding a bus back to the station wasn’t easy to cap it all. Don’t expect to turn up in Bruges on a train and spend a pleasant hour or two before moving on. Unlike many cities in The Netherlands, Germany and Italy, the information lets you down.